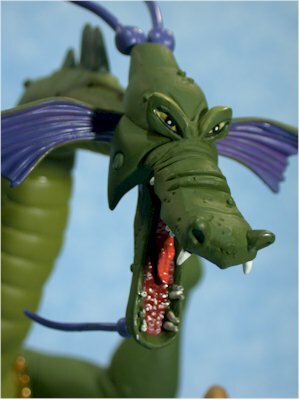 The game was damn expensive though - seems to me that while others were still a quarter, Dragon's Lair was one of the first, if not the first, to bump the price to 50 cents. 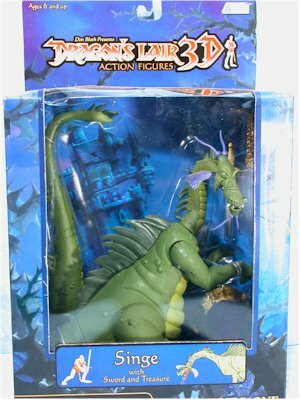 This fall a new version is being released for home systems called Dragon's Lair 3D. 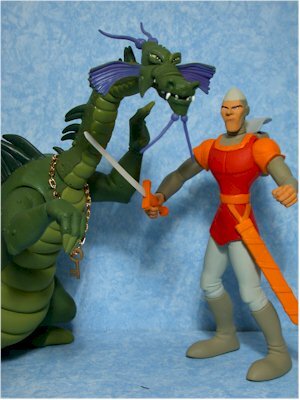 In conjunction with this new game, Anjon is releasing a series of action figures, including Dirk of course (reviewed on Tuesday, August 20th at Movie Poop Shoot), Mordroc, Daphne and the deluxe dragon Singe, reviewed here. Suggested retail on the regular figures is about 9 bucks, while Singe runs around $20. The colors and style are eye catching, but the window is likely to end up damaged on the shelf. Also, they really needed to add some explanatory text. With the new game still not out, and the previous game well in the past, many kids won't know much about these characters. I'm happy with the sculpting on the entire line. While it's true that cartoons are easier to match due to the simplicity of design, it's still quite possible to produce poor sculpts. Thank goodness that's not the case here. The overall body sculpt looks nice, and the head sculpt is particularly well done. I have but one complaint, and it's one most folks will have. Singe is clearly out of scale, as he's barely taller than Dirk. This is due to costs of course - an in-scale Singe would have been huge. But adding a small scale Dirk and Daphne to the set would have really improved the figure, and added to the accessories, making the figure a far better value. I don't have any real complaint on the paint ops. While they are very simple, they are all clean and nicely done. Unlike Dirk, who had some inconsistencies in some of his color, Singe was smooth and clean all around. I was disappointed by the articulation, particularly since they tried so hard. Singe has a far number of points - ball jointed shoulders, cut thighs, neck, cut joint at the base of the neck, and two points in the tail. These points are hidden by the rubber of the tail, and the end of the tail, along with the neck, are made of a bendy material. Unfortunately, I wasn't impressed by the bendy material. While it was possible to get it to hold a position for awhile, it only really worked with extreme positions. The hidden joints in the tail worked poorly for me, and perhaps it was a QA issue. While one of them would click into place, the other didn't work at all, simply popping back. The single best joint his his jaw. He can open his mouth nice and wide, or close it up tight, and it really adds to the look of the figure. 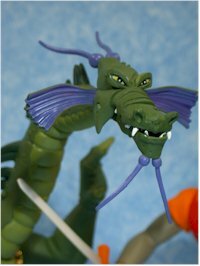 But cut wrists would have really been nice, and the issues with the tail damaged my opinion in a big way. Singe comes with the magic sword, the large jewel into which the sword fits (think Excalibur), and a gold key on a metal gold chain. 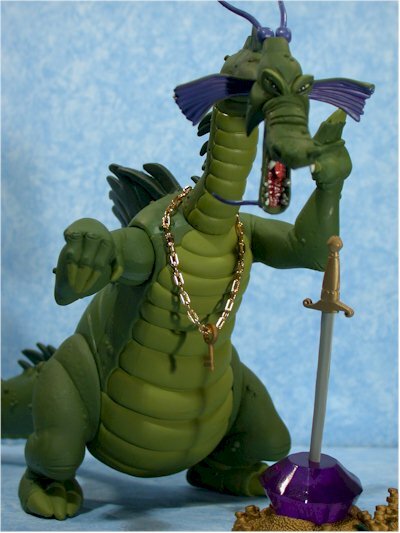 The chain and key fit nicely around Singe's neck, and the sword fits perfectly into the stone. The accessories make complete sense and all come right out of the source material. Still, it's a bit light on the accessory side for a figure this expensive. As I mentioned earlier (and stole from a poster at the Buzz Board), having a small Dirk and Daphne would have really helped. While I like the figure, the twenty dollar price tag is simply too high. Fifteen bucks perhaps, but the high cost on this entire line hurts it overall. While I was pleasantly surprised with Dirk, who I purchased first, I was disappointed with Singe. Anjon did such a terrific job with Dirk that I expected the same - or better, considering I was paying twice as much - with Singe. Alas, it wasn't to be. Less articulation, the problems I had with the tail, and the high price point all hurt this figure. I could have dealt with the scale problems, if they'd done a better job in the other three areas. - Big Bad Toy Store has Singe for $19, and the set of three for $30. You can also buy the individual figures for ten bucks each, all plus shipping of course.